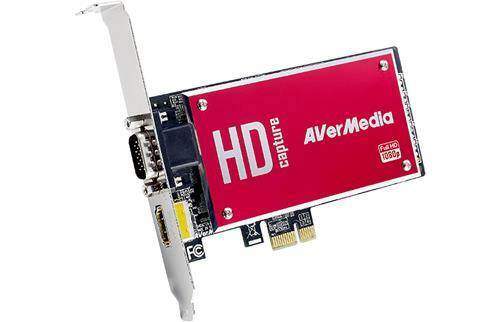 The exponential demand for high definition video has been marked by the rise in demand of HDMI video equipment. The demand has created a significant reliance on HDMI output interfaces in contrast to previous years, requiring manufacturers to scale up output of HDMI equipment. As a result, previous production issues deemed acceptable or at most having minimal impact on delivery are now more prolific lowering overall productivity, requiring additional resources and increasing the risk of low product quality. Without a reliable solution within the quality control process, the defective product is able to pass through inspection and is, consequently, shipped for delivery to the end client. What is a small issue develops into a large-scale problem once the video network is installed and setup. Until a video monitor fails to display the content, a single faulty HDMI pin can go undetected and eventually leads to hours of wasted time and resources. Essentially, the scenario equates to the idea of searching for a needle in the proverbial haystack. 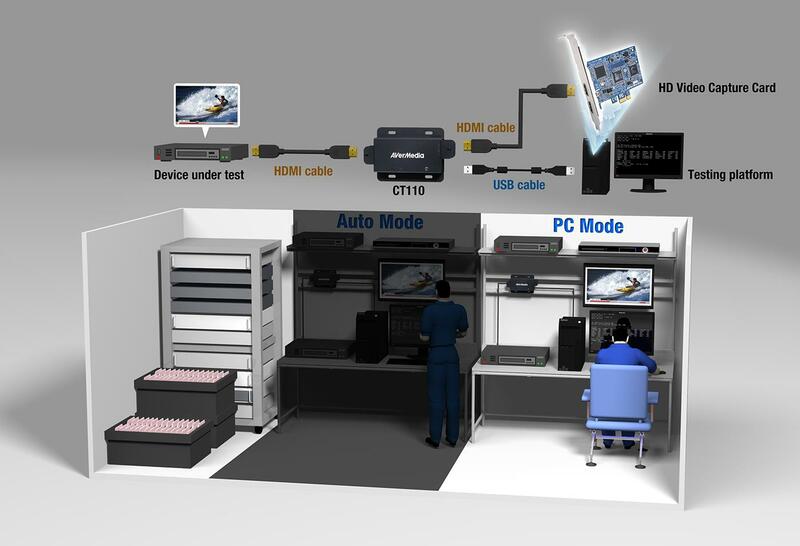 Possessing the tools to detect HDMI pin voltage levels throughout the manufacturing process is a critical factor in developing a product line within acceptable quality control tolerances. In addition to reliability, the solution must have the capacity to detect HDMI output voltages, normally a much lower value in traditional production lines. Enter the CT110 portable HDMI signal detection tool designed with manufacturing needs in mind. When compliance requirements call for strict adherence of performance guidelines to pass validation, the CT110 delivers quality control in a simple to use package. Designed to detect DC voltage levels for each and every HDMI signal pin, the CT110 gives manufacturers the ability to measure continuity for all HDMI features (HDMI 1.4 standard). With rapid detection capabilities, each product can be tested within seconds allowing for continuous production without production delays. Not only is the CT110 easy to use but it is also available in two operation modes, Automatic and PC. 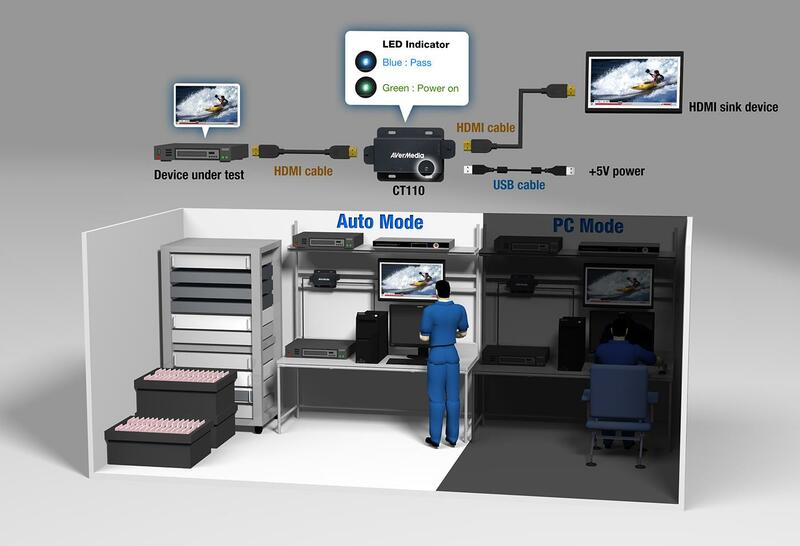 In an Automatic mode setup, validation of DC voltage levels for a source device (HDMI) is easily setup. 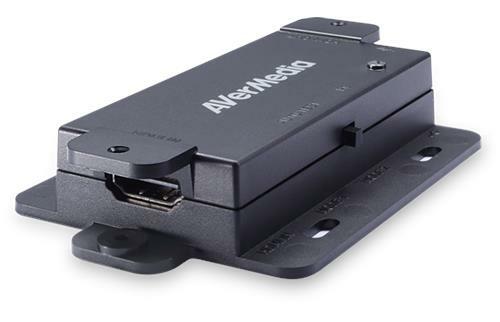 Simply connect a media source to be tested to the CT110 allowing it to broadcast into the HDMI sink device delivering a near instantaneous indication of the HDMI pin quality. The two indicator LEDs are all that is required to identify a failed or passed quality control test. 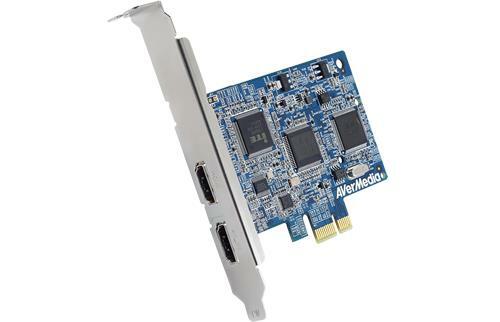 The secondary mode option, PC mode, provides further support for validation and analysis of HDMI DC voltage readings through the AVerMedia DarkCrystal HD capture card installed on the PC. Once connected to a HD capture card block, the CT110 can transmit maximum, minimum, and average values for each HDMI pin and relay them to PC connection. Integrating the CT110 through the capture card into the quality control process allows a thorough comparison of the sample data to a pre-determined golden sample, in so doing, further strengthening the inspection of the data from the device under test (DUT). Through PC mode, the CT110 becomes an integral part in the quality control and adherence framework and precipitates effective resolution mapping through the use of computer models. The CT110 is the effective and necessary tool for all product developers who wish to enjoy improved productivity and consistent quality control processes by speeding up the validation of HDMI source output.